Hotel General Manager Adam Gorst (left) and Captain Roger Bilton (right). Above: Grand Princess has a sleeker look after the removal of the Skywalkers nightclub. Below: The ship's original look. Above: Captain Bilton introduces Grand Princess' senior officers at a reception in the ship's new Piazza. 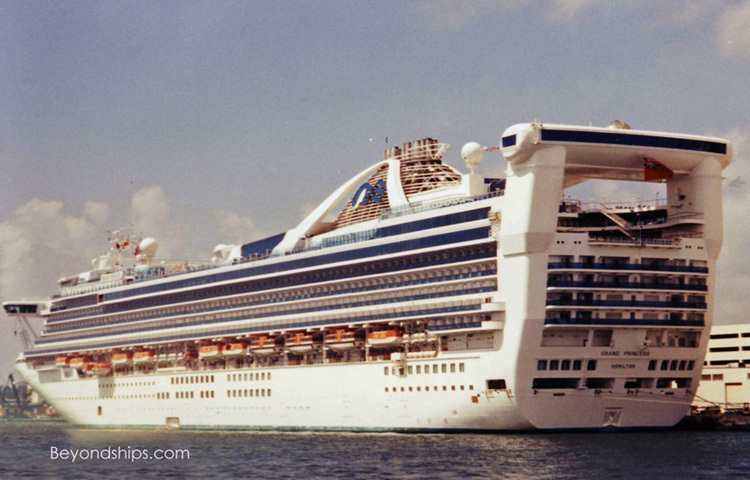 Since entering service in 1998, Grand Princess has been one of the most popular and successful cruise ships operated by a major cruise line. 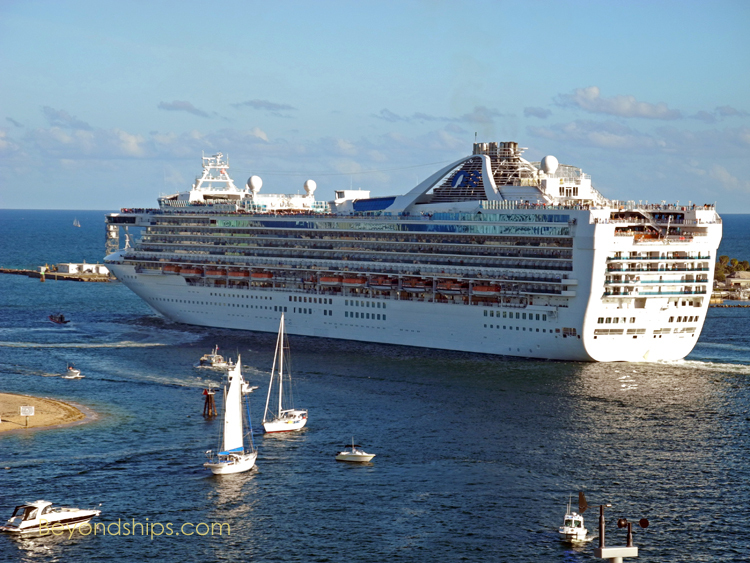 In the Spring of 2011, Grand Princess spent the better part of a month in a dry dock in the Bahamas. During that time, the ship was so extensively refurbished that she is often referred to as the “new Grand Princess.” I sat down with her master, Captain Roger Bilton, and her Hotel Director Adam Gorst, to talk about the drydock and how it has impacted the Grand Princess. “It was a major, major drydock. Most drydocks only take at most 10 days. This one was three weeks,” Captain Bilton began. “A total of $80 million was spent, which is the highest amount ever for a Princess ship for a drydock,” added Mr. Gorst. “The biggest change was taking off Skywalkers, the nightclub at the back,” Captain Bilton noted. Skywalkers ran the width of the ship and was suspended in its own structure over the open decks at the stern of the ship. It was a distinctive but controversial feature. Captain Bilton is amused by some of the rumors about why Skywalkers was removed. “It was my wife who drew it to my attention ‘Did you realize that the Skywalkers was going to fall off?” he laughed. Consequently, a major part of the drydock involved transforming Grand Princess’ atrium, which had been called the “Grand Plaza” into a “Piazza.” The Piazza concept was first introduced on Crown Princess in 2006 and repeated on Princess’ two subsequent ships Emerald Princess and Ruby Princess. It has been retrofitted into other Grand class ships including Caribbean Princess and most recently. Sapphire Princess. The Piazza concept is modeled upon the town squares of Europe. The area at the base of the atrium has a marble floor upon which street entertainers such as jugglers, musicians and dancers perform from time to time. Immediately surrounding the central area are tables and chairs where guests can sit and have something to eat or drink. Beyond the tables and chairs are venues such as the International Café and Vines Wine Bar, which are new venues for Grand Princess added during the drydock. When Grand Princess entered service, she was considered an innovative ship. The drydock gave her the opportunity to be an innovator again as new concepts were introduced for the first time on any Princess ship. One of these is in the Piazza - - Alfredo’s Pizzeria, a gourmet pizza restaurant named after Princess’ corporate chef Alfredo Marzi. “They honored him by using his name there. He designed the menu and the pizzas that go on it.” (See our review). Captain Bilton added: “We have got the Crown Grill, which we did not have before.” (See our review).